We are living in a Knowledge Economy . At the same time all of us are under Information Overload. So we have this very interesting situation where in order to be relevant , we have to manage the Knowledge available with us. At the same time , there is so much information that it is a task in itself to isolate good from bad information. Its getting right information to right people at the right time. For an Organization , it would consist of activities by which the Organization gains knowledge from its own experience and from the experience of others and then applies this knowledge to fulfil its mission. 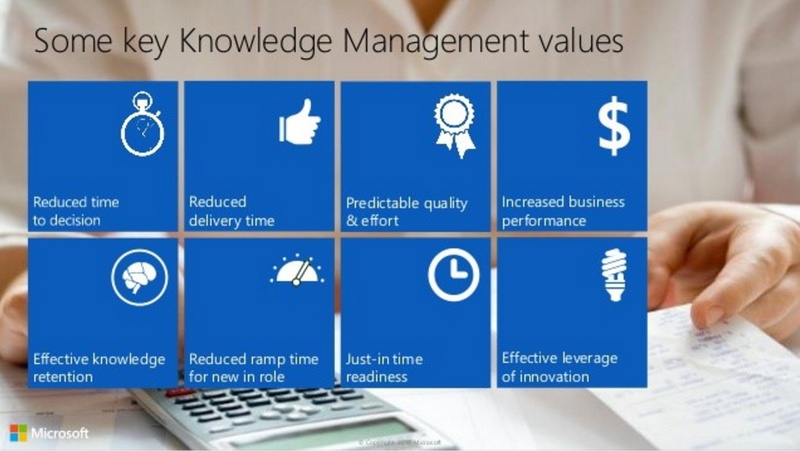 How do we help in building systems for Knowledge Management? In any organization , knowledge is generated and transferred via Email , text chat, audio and video , documents , Internet articles , Standard Operating Procedure manuals , etc. Every single piece listed above can be tagged . As a result , most of the information flow in an Organization will happen within some workload of Office 365 . What remains now is to tap into this information such that it is available to the right person at the right time and right place . That is exactly what we help the Organizations to do . We take it one step ahead and help Organizations then craft Standard Operating Procedures which go a long way in ensuring that there is standardization of processes and a free flow of Information.